Kotobukiya proudly presents Miverva in her Omniscience Regalia from the popular trading card game "Cardfight!! Vanguard" ! A new gorgeous work based on Tony Taka's illustration ! Cardfight!! Vanguard is an internationally popular Trading Card Game published by Bushiroad, originally conceived by the manga author Akira Itou. The game is currently available in Japanese, English and Korean, with official organised play worldwide. There are also ongoing anime and manga about the franchise. ・Minerva stands with her wings outspread and weapon at hand, ready for action ! ・Minerva stands 20cm tall in 1/8 scale. ・The exceptional quality sculpt brings Minerva to life including all the fine details like the wrinkles and folds in her clothing and hair. 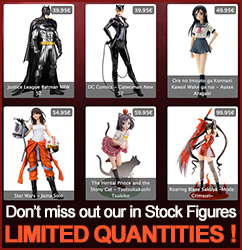 Display alone or alongside other Kotobukiya japanese statues !